The luxury Chalet des Alpes, is set high above the Rhône Valley in the village of Lens, just 10 minutes from the famous 4 season resort of Crans Montana. 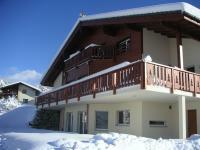 This privately-run catered chalet offers excellent levels of service and comfort. We aim to go that little bit further and we try to be different without taking away comfort and service. Located 10 km from the historic centre of Rennes, Les Gîtes d'Emilie offers self-catering studios with a private terrace. Free Wi-Fi access is available in the studio. The studio features a living area with a TV, wardrobe, ironing facilities and a bathroom. The kitchenette includes an oven, microwave and refrigerator. Breakfast products are available in the studio at an extra cost.